"Life change happens when hope is ignited by opportunity that is driven by passion"
Author and Leadership Expert Dave Dungan is taking the business world by storm! With over 20,000 Books Sold you could say Dave is a very talented author. But you haven’t heard him speak! Dave’s speaking events leave you and your company ready to take on the world building one leader at a time. With over 30 Years in Leadership, author and speaker Dave Dungan has an inside look on what it takes to be successful as a leader of leaders. This Book is PACKED with information that can turn a company around NOW. Flip to any chapter without reading anything prior to it and you would still be able to use what you learned. On the go, at the hotel, hanging out at the house or having a meeting with your team are all options for grabbing a quick shot of leadership development. Dave’s unique style allows any lesson or chapter to be applied independently for easy access to MUST HAVE leadership information. Don’t Follow Me I’m The Leader is something every company should implement at the ground floor. Leaders have shown us over time that they can overcome the struggles of business. Boss’s have shown us just the opposite. Is this the Magic Pill for Better Business? It’s no secret that your business practices flow from the top. A better leader continues to build an even stronger foundation. Great News! We have just signed a publishing deal with ZDL Publishing to begin the process of getting Don’t Follow Me I’m The Leader printed in Chinese. The publishing company ZDL, which is located in Beijing, contacted us a few months ago about coming on board with their company to make the book available in Chinese. After hearing about the process and the potential market we were all in. We learned through the conversation that the book would first be presented to the People’s Republic of China for review. "The only complaint about the book was that it was too good. Students reported multiple reads, which is astounding!! It provided a framework to understand key concepts and underscored the importance of experiential learning. Easy yet insightful read!! " leadership principles that can empower our relationships as well as our careers."" The New Standard For Leadership! Don’t Follow Me I’m The Leader is making a huge wave across just about every business market. In fact, there isn’t any business, non-profit, startup, group, meetup, or even lemonade stand that won’t benefit from the invaluable information inside the breakout book. With virtually any marketing whatsoever, this book has organically been passed through the hands of people all over the world. There is a reason it is successful and you should find out what all the buzz is about! Author and Speaker Dave Dungan has been speaking and engaging companies and people for over 30 years. His view on leadership and what it takes to be a successful leader is unmatched in the cooperate world today. Events are often wasted on fillers that hopefully employees and executives can take something away from. Think of your event with Dave as a dynamic consulting and personal One on One session. From the ground up your event will be rethinking what it is to be a true leader and what to expect in the role of new leadership. The days of being a successful author in the hills of some secluded haven are long gone. It’s time to impact peoples lives and connect across the world. Dave has been featured on Leadership and Business Entrepreneur Radio stations from as far as the US to Malaysia and India. His books have sole in over 23 different countries. Have a Web or Podcast? Dave’s experience as a Leadership Development Expert have brought him to companies of all sizes to work and help push the boundaries of success. Instead of 1’s and 0’s, Dave deals in structure and environment often times reapplying the glue that once held companies together. 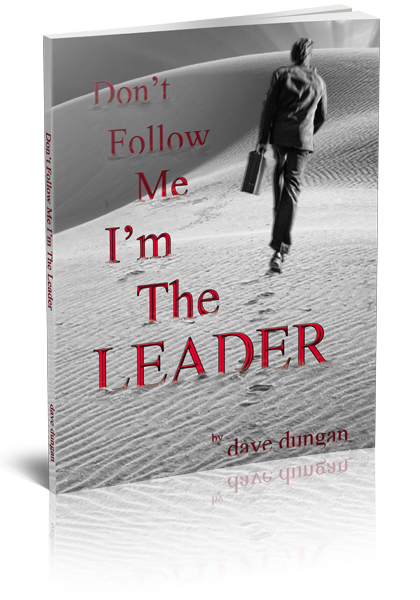 Get Don’t Follow Me I’m The Leader by Author Dave Dungan and start your transformation today. Take the steps to become that person today and start on the path of achieving the wins in your life. There’s no time like right now to begin your journey. Talk with your employees, your management, friends, families, colleagues and everyone who the book can affect in a positive way. Don’t Follow Me I’m The Leader was written in a way where anyone can jump in at any chapter and remove an applicable lesson and change from that text. We will be sending a regular Newsletter out to keep people updated as well as provide exclusive leadership content. Events going on in your area will be sent out as well as great links to content in the blog and other places on the web. Tweet, Hashtag, Email, Instagram, Facebook, tell your local news, email blogs you like to read, contact podcasts and do whatever you can to help out. Don’t forget to Tweet Dave @authorddungan and find the rest of his social network links at the very bottom of the website on any page. Sign up for our Exclusive Leadership Content! Author and Dynamic Speaker Dave Dungan has over 30 years in leadership development. Dave's experience ranges from startups to non profits, consulting to event speaking. Dave's unique ability to connect with people and truly inspire future leaders is unmatched in todays presentations. Dave is currently working on his third release as well as helping people, businesses and the future leaders of tomorrow to completely tap their full potential as true leaders.